Topping the demand for last year’s classic between the Pittsburgh Penguins and Washington Capitals was going to be a tall order, but it looks like the New York Rangers and Philadelphia Flyers are up to the task. Tickets to the 2012 NHL Winter Classic at Citizens Bank Park in Philly are averaging $489.16, over $80 or 19.7% more than the average cost of tickets to last year’s matchup between the Caps at Pens ($408.50). One important caveat to this comparison is that the capacity of Citizens Bank Park is significantly smaller than last year’s venue, Pittsburgh’s Heinz Field. The capacity of Heinz Field for the 2011 Winter Classic was 68,111 seats, while Citizens Bank Park’s hockey configuration will fit only 43,500 fans. Despite these lofty prices, the average cost of a ticket to the game has actually fallen by nearly 50% within the past month and a half. Back on Nov. 14, average prices to the Winter Classic peaked at $745, but within the last three days, tickets to the game have averaged $376 – a difference of $369 or 49.5%. Based on what we’ve seen in terms of purchases through SeatGeek, we’re expecting ticket prices to hover in this mid-high $300 range before trailing down slightly in the immediate 24-48 hour run-up to the game. 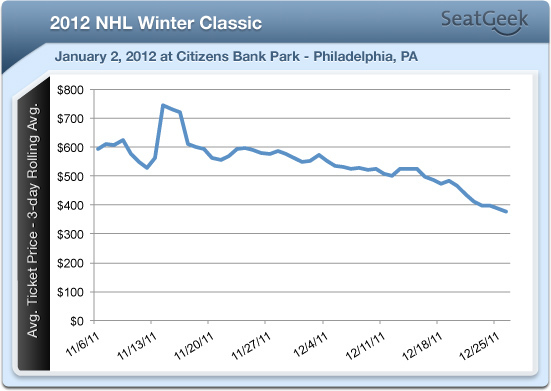 Surprisingly, the 2012 Winter Classic is not even the most expensive regular-season NHL game this season. The home opener for the Winnipeg Jets vs Montreal Canadiens on Oct. 9 fetched a jaw-dropping $744 on secondary ticket markets. This price is likely reflective of a few unique factors, including the fact that this was the newly relocated franchise’s first game in Winnipeg, the limited capacity of Winnipeg’s MTS Centre (15,004) as well as local regulations in Manitoba against the resale of event tickets that likely limited ticket supply in the face of tremendous demand. However, 2012 Winter Classic tickets are still fetching a higher average price than tickets for many other major sporting events in Philadelphia. Winter Classic tickets are selling for more than any Eagles home game within the past three seasons. When compared to Phillies games played in Citizens Bank Park, only a set of five playoff games (three World Series, two NLCS) from the Phillies’ 2009 NL Championship season fetched higher prices than this year’s Winter Classic. Winter Classic tickets are also currently priced higher than tickets were for any of the Phillies’ three 2010 NLCS home games against San Francisco. Currently on SeatGeek, the least expensive available ticket to the Winter Classic is a $357 ticket in Section 301, Row 4, while the most expensive listing is a $5508 listing in Section 139, Row 23. All of SeatGeek’s ticket listings to the game can be found on our Winter Classic event page, which features a special dynamic stadium map of the venue. It doesn’t hurt that HBO has been following both teams for the month leading up to the classic for the award-winning documentary 24/7 Flyers Rangers: Road to the Winter Classic.